In such freezing, adverse conditions, man comes very close to breaking point. What was the real cause of the disharmony which destroyed their chances of success? That got your attention I hope. Ever since I saw this headline in Kathmandu news portal República, I’ve been determined to use the word dogging in the title of a blog post. Today’s Everest climbers are often compared unfavourably with the heroic expeditions of the past. There is a popular belief that the world’s highest mountain has become a circus populated by pampered egos with no climbing ability. But are we so very different from our predecessors? In 1972 an international expedition set out to climb Everest by a new route linking the Lhotse Face with the North Ridge. 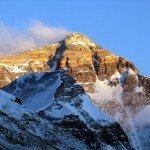 Led by a veteran army colonel, who had attempted K2 and Annapurna and had a penchant for trimming cabbages, the expedition was beset by conflict from start to finish. As this rare footage shows, team members spent many hours bitching about each other in their tents, and the German and Italian climbers stormed off after a blazing row, taking vital equipment with them. 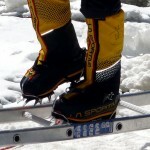 The film shows that climbers took unnecessary luxury items to base camp with them in those days too. Team members were frequently stealing one another’s hair driers, and at Camp 3 some were even having manicures. With fourteen expeditions racing to reach the summit that year, disaster seemed inevitable until one of the team had the bright idea of opening a salon. Yes, that’s right, I’m talking about the International Hairdresser’s Expedition to Mount Everest, made famous on that well-known extreme sports show Monty Python’s Flying Circus. Only marginally less comical than this expedition was my own ten-year journey to climb Everest. You can read all about it in my book Seven Steps from Snowdon to Everest, published digitally last month and available as a paperback next year. 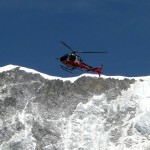 ← What does the Nepal Mountaineering Association do? A classic, but please do dedicate another post to “Climbing the North Face of Uxbridge Road” sometime in the future. Yes, of course. 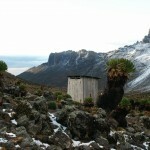 That and the Kilimanjaro expedition. I agree-I think people always look to the past as somehow being purer and in some ways obviously climbing Everest was less commercialised 50 years ago. However I think lots of expeditions have suffered from the clash of too many egos. Aleisteir Crowley’s behaviour on the 1905 Kanchenjunga expedition being a classic case of bad behaviour in the ‘good old’ days. Sorry just spotted you did a post about Crowley last month! Currently reading “The Maverick Mountaineer” by Robert Wainwright – a bio of George Ingle Finch. For clash of personalities there is nothing to beat Finch v “The Establishment” about the 1920s Everest expeditions.